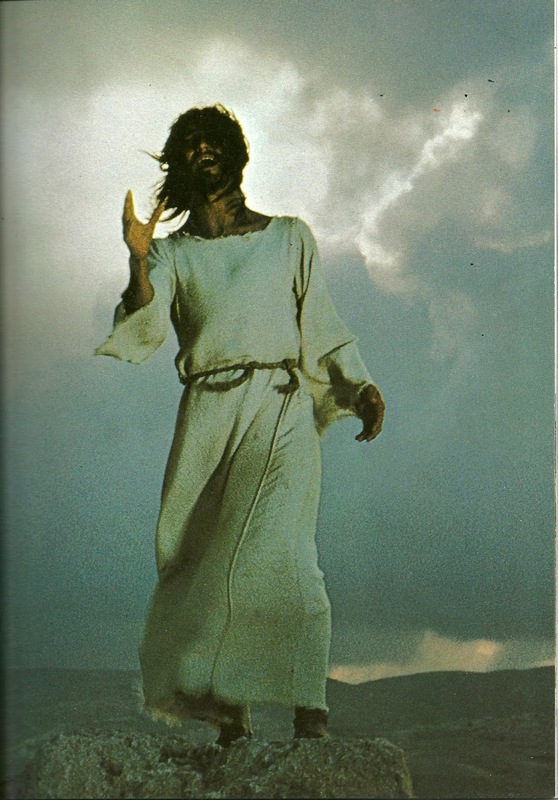 Ted Neeley turned in a memorable performance as Jesus in the 1973 movie "Jesus Christ Superstar." To celebrate the 40th anniversary of the movie's premiere, Neeley and cast members Yvonne Elliman (Mary Magdalene), Barry Dennen (Pontius Pilate) and Josh Mostel (King Herod) will be part of a cast reunion Sept. 7 at Hollywood Blvd. Cinema, 1001 W. 75th St., Woodridge, and Sept. 8 at Hollywood Palms Cinema, 352 S. Route 59, Naperville. "Jesus Christ Superstar" will be shown at 7:30 p.m. Sept. 7 at Hollywood Blvd., and at 5 p.m. Sept. 8 at Hollywood Palms. The cast members will greet fans an hour before the movie's showing. Tickets for the Hollywood Blvd. showing are available at www.atriptothemovies.com and for the Hollywood Palms showing at www.hollywoodpalmscinema.com. I had the honor of talking to Neeley about a variety of topics, including what it was like working with the late Carl Anderson, who played the character of Judas in the film. Q - Good talking to you again. "Jesus Chris Superstar" premiered on Aug. 16, 1973. Are you surprised at the longevity of the film? Why do you think it has held up so well after all these years? I am absolutely amazed that Norman Jewison's film, "Jesus Christ Superstar" still attracts remarkable support around the world. If you'd like to experience this, just take a look at my Facebook page. It is my belief that this continues to be so because of the personal spiritual connection everyone finds as they view the work. They tell me each time they watch the film, "it feels like the first time!" So, they must then experience it again with their families and friends, always on Easter and at Christmas in addition to many times throughout the year. Q - Of course, you will be at Hollywood Palms and Hollywood Boulevard in September for a cast reunion with Yvonne Elliman, Barry Dennen and Josh Mostel. I know you recently were at a screening of the movie with Barry Dennen. When was the last time the four of you got together? Is it bittersweet because Carl Anderson won't be there? Barry, Yvonne and I got together for a fund raiser for the California Youth Theater/Youth Theater America in 2006 and it was fantastic. The four of us have not been in the same place at the same time since our remarkable experience during the film shoot in Israel. Q - Speaking of Carl, what do you think he brought to the role of Judas? I know you originally auditioned for the role of Judas in the movie. What would you have brought to the role if you were cast as Judas? Bittersweet does not begin to scratch the surface when it comes to my feelings for my dear friend and magnificent collaborator, Carl Anderson. I miss him, immeasurably. You ask what he brought to the role of Judas. Carl brought truth, as we perceived it, from our parallel backgrounds of life and faith, as it was translated through the teachings of our childhood. Carl and I worked together diligently, toward finding a human relationship between the two men Norman gave us the wonderful opportunity of portraying, within the concept of Tim's lyrics and Andrew's music, which until then, the magnificent passion play had not been perceived through the concept of a rock opera. Yes, I originally auditioned for the role of Judas in New York. The amazing theatrical director, Tom O'Horgan, very kindly advised me he felt I would be better suited to research and prepare for the role of Jesus. Having worked with Tom in both original rock musicals, "Hair" and "Sgt. Pepper," I respectfully followed his advice, as I, along with 42 other actors, singers and dancers, entered the realm of that original New York production, I never looked back for the "what ifs" of playing Judas. After all, the remarkably talented Ben Vereen created the role of Judas within that first ever rock opera presented as a Broadway musical. By the time Norman was looking for his film cast, both Carl and I were very comfortably prepared for our extensive collaboration with Norman and his remarkable film company of technicians, dancers, singers and actors, throughout our amazing journey in Israel. And as we all know so well, Carl Anderson created our/the unforgettable cinematic Judas. Q - It seems like Hollywood wants to remake every movie these days. Would you object to a new version of "Jesus Christ Superstar" being made? If the movie was remade, what changes would you want to see? I certainly believe in supporting all artistic endeavors. However, I can't see why anyone would want to rework Norman's brilliant vision in this, or any film in his remarkable, artistic, body of work. Q - Did working on the movie strengthen your own Christian beliefs? What is the message of "Jesus Christ Superstar?" Carl and I very naturally brought our parallel spiritual beliefs, along with our strong and deeply respectful friendship with us. Once we arrived on set together, in Israel, and through the deeply spiritual, passionate and nurturing guidance of our visionary director, Norman Jewison, the depth of that spiritual awakening was multiplied exponentially, from sunrise through sunset, and on into the deep dark night of each new day. As the result of Norman's granting me the opportunity of collaboration within the role for which I am infinitely honored to have performed, I interpreted the concept of "Jesus Christ Superstar" as this. It is the last seven days in the life of Jesus Christ, as seen through the mortal eyes of his friends and his contemporaries, all of whom saw him as a man. As the song lyrics say, "He's a man, He's just a man." Even more than we are now, the people then were deeply influenced by the political turbulence of that period in our world history. Q - The album "Ted Neeley 1974 A.D." was recently remastered. Why was it important to you to get the album remastered? For quite some time, so many people everywhere have been asking me if that album is available. So now, in its newly available format, all of us at Team Neeley felt the wonderful folks who are interested in the music, certainly deserve this new pressing of the digitally remastered CD. Everyone at Team Neeley prefers the sound quality of this new CD to that of the original LP. We certainly hope all of the very generously interested and wonderfully supportive people agree. Q - Of course, you also have been touring this year with your band The Little Big Band and you also released a new album, "Working for the Words." What goals did you have for the album and do you think you achieved them? For this project, I experienced the opportunity of collaborating with the multi-talented lyricist, songwriter, singer, multi-instrumentalist musician, and producer, and sound designer extraordinaire, who just happens to be my long time friend, Bruce Landon Yauger. The inside black and white photography is by my long time friend, the brilliant photographer, Christopher Ameruoso. You asked about our goals with this album. As with all things we do, Bruce and I gave our best efforts to create and record songs that hopefully please the listener, with each song having it's individual identity. Q - You've done so much in your life. Do you have any dream projects or collaborations? And as for your question regarding achieving one' goals, who knows if an artist ever really achieves their goals. I feel the answer to that is ultimately decided by the people who hopefully will appreciate the work. I definitely have dream projects, thankfully, most of which are now in development. I treasure the possibilities of continuing the remarkable, long term relationships created within past and present experiences and I look forward to the hopeful possibilities of many more enlightening moments and lasting new friendships, within the experiences yet to come.